Events and actions this week lend credence to an evolving theme: Trump isn’t all that interested in typical legislative stuff like passing healthcare or his budget — his passion and focus are on enriching himself, and making America white. This week was also unfamiliar territory for Trump: he couldn’t control the narrative the entire week. We’re learning Trump is great on offense, but inept on defense. As Trump’s wiretap claim entered its second week, Trump still offered no evidence to support it. Conway backed Trump saying, “microwaves that turn into cameras” can spy on us. Spicer said Trump didn’t mean wiretapping literally when he tweeted about wiretapping. Office of Management and Budget Director Mick Mulvaney claimed Obama had been “manipulating” jobs data. The Trump regime had its second email scandal in two weeks. WSJ reported that Tillerson used an email alias – ‘Wayne Tracker’ — while at Exxon, to discuss climate change. Kushner is set to net $400 million on the sale of a NYC office building to a Chinese firm with murky links to the Chinese power structure. Ivanka imported 53 metric tons of Chinese goods while her father was making his “Buy American” speeches. A businesswoman with ties to Chinese Intelligence and the Chinese ruling elite purchased a penthouse in a Trump property for $15.8 million. These ties, along with the 38 trademarks granted to Trump in Week 14, as Trump readies to host China’s PM at Mar-a-Lago. Trump has shifted on both his “One China” policy and trade war threats in recent weeks. Trump insider Stone told AP he may have been the subject of surveillance by Intelligence for his possible role as a foreign agent for Russia. Former WH staffer Monica Crowley, who was fired for plagiarism, took a job as a foreign agent for a Ukrainian oligarch with ties to Russia. Reuters uncovered that Russian elite have invested close to $100 million in Trump luxury towers in Southern Florida. The yacht of Trump financial backer Robert Mercer was spotted in the British Virgin Islands next to the yacht of Dmitry Rybolovlev, the Russian oligarch mentioned in Week 17 for his multiple connections to Trump and Wilbur Ross. Mercer also has close ties to Bannon, and collaborated with him on at least five ventures, including Breitbart News. A document released Thursday showed that Flynn received three formerly-undisclosed payments from Russian interests, totaling $70,000. WSJ broke that Flynn also had an interaction with a Russian-British national while he was head of the Defense Intelligence Agency, which he failed to report, as required. Russia continued provocations: a Russian spy ship reappeared in the US eastern seaboard, just 20 miles south of a U.S. Navy submarine base. News of the DOJ’s findings that Russian agents were behind the Yahoo hacking, brought Russia interference back front and center. Further to Week 17’s Deep State theme, Trump opened the week signing an executive order on a “reorganizing” of the executive branch, which opened the door to the Trump regime dismantling federal agencies. Tillerson mirrored Trump, saying the proposed slashing of the State Department’s budget would make it “much more efficient,” while offering no vision or strategy for foreign policy. As mentioned in Week 17, much to the consternation and over objections by our media, Tillerson did not bring press along on his first trip to Asia. He did, however, bring one reporter from conservative media IJR — who coincidentally had written a glowing piece about him two weeks prior. Friday, Tillerson said the US was prepared to take military action against North Korea, if necessary. Tillerson cut his trip to South Korea short, citing fatigue. A federal judge in Hawaii halted Trump’s second Muslim ban the day before it was set to go into effect, saying the ban is unconstitutional and discriminates based on religion. The federal judge also cited remarks made by Stephen Miller and Rudy Giuliani on TV in his ruling. Conservative media IJR (same as on Tillerson’s plane) speculated that Obama’s visit to Hawaii was behind the ruling. IJR next day added an editor’s note to the article, and soon thereafter, the reporter resigned. Buzzfeed reported that Nick Ayers, a top adviser, to Pence is an investor in the IJR. Trump’s ranting about the halt of his second Muslim ban at the Nashville rally — “This is watered-down version of the first one” — could be a death blow to his chances in an appeal, which he does plan to file. WAPO reported on a second internal report prepared for the Trump regime, again with data undercutting the premise of his Muslim Ban. Sebastian Gorka, Trump’s top counter-terrorism advisor, was reported to be a sworn member of Hungarian group listed by our State Department as “under the direction of the Nazi Government of Germany” during World War II. In the Netherlands’ race for prime minister, the candidate associated with Trump lost with unexpectedly poor results. Some in Europe noted that Austrian and Dutch elections point to a Trump backlash. WAPO’s David Fahrenthold followed up on three promises made by Trump on November 8: donating his salary; giving away leftovers from Inaugural Committee; and donating profits derived from foreign governments use of Trump hotels to the US Treasury. Trump has given $0 so far. On Friday, the Trump Organization announced it will wait until 2018 to start donating profits from foreign government in his hotels. Anti-Semitic threats continued. CNN created a map to show how widespread Jewish bomb threats have become: so far in 2017, 159 bomb threats in 38 states. Trump’s Muslim ban took another blow from a federal judge in Maryland who suspended the part of the ban that prevented visas from being issued. Trump and his surrogates continued the “judicial overreach” and need to change this imbalance of power, talking point. Trump’s budget got off to a disastrous start when OMB director Mulvaney said of cutting funds to Meals on Wheels that it’s a program, “not showing results.” Words “Meals” and “Wheels” trended on Twitter for the rest of the day. WSJ reported that tax cuts for the wealthy in the GOP’s tax plan would save Trump millions. NJ legislature passed a bill requiring presidential candidates to disclose their tax returns. Continuing his efforts to drain the swamp, Trump nominated his fifth Goldman Sachs employee to a role as Deputy Treasury Secretary. Ethics documents showed that Christopher Liddell, Trump’s director of strategic initiatives, has $3-4 million in stock holdings of 18 of the companies, whose CEOs attended a meeting with him and Trump. By midweek, Republicans including Devin Nunes, chair of the House Intelligence Committee, were turning on Trump for his wiretapping claim. Ryan joined him too. The Senate Intelligence Committee issued a formal statement that there is no evidence of any surveillance (going beyond wiretapping) of Trump Tower during or after the campaign. The statement was issued 15 minutes before the WH daily briefing. At the daily briefing, which started an hour late, Spicer said Trump stands by his allegation that Obama wiretapped Trump Tower. Spicer also parroted allegations first made on Fox News, that Obama used British intelligence agency GCHQ to spy on Trump. GCHQ issued a strongly worded refute of this ridiculous claim. Friday morning, UK media reported the US made a formal apology to Britain for the WH accusation that the GCHQ wiretapped Trump Tower. 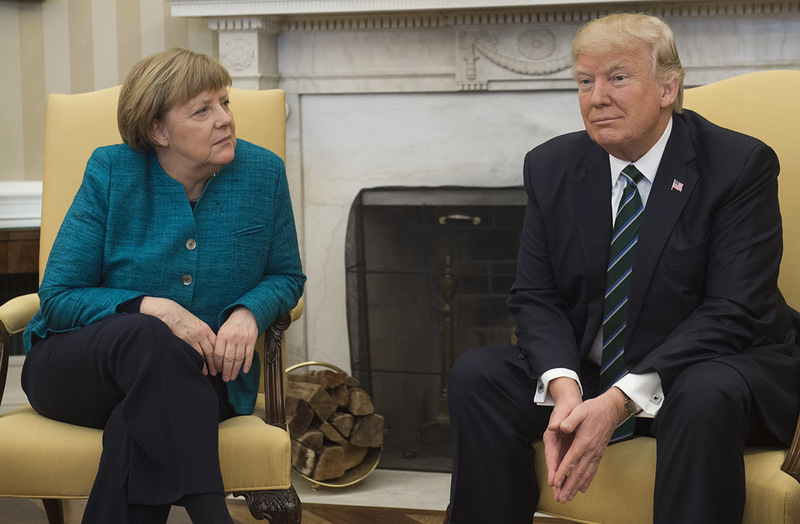 With cameras rolling, Trump refused when asked by Chancellor Angela Merkel to shake her hand. Multiple pictures surfaced of Ivanka inexplicably seated next to Chancellor Merkel at the meeting. Trump misspoke during the press conference with Merkel, referring to the US as a “company” instead of a country. Also at the press conference, Trump turned to Merkel in answering about his wiretap claims by Obama and said, “At least we have something in common perhaps.” He claimed he got the information from Fox News. Oklahoma Rep. Tom Cole became the first congressional Republican to call on Trump to apologize to Obama for his false wiretapping claim. Friday it was announced that Trump’s DOJ is working to speed deportations, shifting immigration judges to 12 US cities where they claim there are more immigrants who have committed crimes. Cases continued to surface of non-criminals being targeted for deportation, including a mother of six in Chicago during a routine check-in with ICE. Her congressman was handcuffed defending her. Canada’s version of the Girl Scouts — the Girl Guides — canceled all trip to the US citing concerns over Trump’s Muslim ban, and its message. Rep. Steve King said Blacks and Hispanics “will be fighting each other” before overtaking whites in population. Few in the GOP condemned him, as King continued to the TV circuit reiterating his white nationalism. The Trump regime went to court to try to bring the consumer protection agency created by Sen. Elizabeth Warren after the 2008 recession under direct control of Trump, opening the door to dismantling it. Continuing his pattern of hiring insiders, Trump plans to nominate Kellyanne Conway’s husband to a powerful post overseeing the Federal government’s lawsuits, including the Muslim ban. Republicans continue to face energized, raucous crowds when returning home. Sen. Joni Ernst faced a packed crowd, which frequently booed her.